You didn't think all the news today would be purely about Apple or gaming, did you? 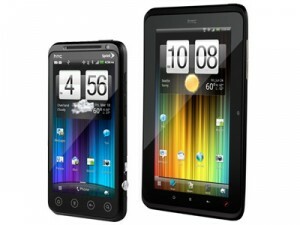 Sprint announced this morning that the HTC EVO 3D and the HTC EVO View 4G tablet are both launching on June 24. Both devices will run Android Gingerbread and offer 4G support for the carrier's next-gen WiMax network. With two-year contracts, the EVO 3D will cost $199.99, and the EVO View 4G is priced at $399.99. What's your opinion of 3D technology? Is it worth buying into now, or should hopefuls wait? Is there room in the market for the petite form factor of 7-inch tablets? (Or is the 4G support the best part, regardless of size?) Hit up the comments and let us know if you're planning on picking one of these up or waiting. OVERLAND PARK, Kan. – June 6, 2011 – Two of the "must-have" gadgets of 2011 are getting ready to make their debut Sprint (NYSE: S) today announced the June 24 availability of HTC EVO™ 3D and HTC EVO View 4G™ on America's Favorite 4G Network1. America's first 'glasses-free' 3D 4G device will be available for $199.99, and HTC EVO View 4G, the first 4G tablet in market, will be available for $399.99. Both prices exclude applicable taxes, and the devices require a new two-year service agreement or eligible upgrade. Customers can pre-order HTC EVO 3D or HTC EVO View 4G at any participating Sprint Store with the purchase of a $50 Sprint gift card (per device). On June 24, Sprint Stores nationwide will open doors at 8 a.m. local time for customers to get a jump-start on purchasing these hot new devices. Additionally, Sprint Premier customers will have the opportunity to purchase HTC EVO 3D online three days before the national launch, while supplies last. Qualifying customers will receive an email on June 21, or they can log on to their account at www.sprint.com on June 21, click "show me my rewards" and then "Sprint Premier Community" for more information. "Sprint takes device innovation to a whole new level with the two newest members of the EVO family, HTC EVO 3D and HTC EVO View 4G," said Fared Adib, senior vice president – Product Development, Sprint. "HTC EVO 3D provides our customers the ability to capture and view content in 3D and share at 4G speeds; HTC EVO View 4G expands on the capabilities of tablets by introducing the digital pen, and allows our consumers to do more than they ever imagined was possible." HTC EVO 3D takes the mobile multimedia experience to a new level, providing the ability to capture and view in 3D and share at 4G speeds, offering consumers the ultimate glasses-free 3D experience. Built with the Android 2.3 operating system (Gingerbread), HTC EVO 3D features America's first 4.3-inch, qHD 3D display and a powerful 1.2GHz Qualcomm® Snapdragon® dual-core processor. HTC EVO 3D also features dual 5-megapixel cameras, which can be used to capture high-quality conventional and stunning 3D images and videos, opening up new frontiers for user-generated content, social networking and streaming video. LAPTOP Magazine honored HTC EVO 3D with its Best Smart Phone Award and the coveted Best in Show honor at CTIA this spring. PC World added, "The design is gorgeous, and the combination of dual-core Snapdragon processors with 4G can't be beat. Suffice to say, I can't wait to get my hands on this phone this summer." Phonearena.com named HTC EVO 3D and HTC EVO View 4G as "Best of CTIA 2011." Boy Genius Report said, "The HTC EVO 3D and the HTC EVO View 4G tablet were among our favorite new gadgets shown off at CTIA." HTC EVO 3D requires activation on one of Sprint's Everything Data plans plus a required $10 Premium Data add-on charge for smartphones. Sprint's Everything Data plan with Any Mobile, AnytimeSM includes unlimited web, texting and calling to and from any mobile in America while on the Sprint Network, starting at just $69.99 per month plus required $10 Premium Data add-on charge – a savings of $39.99 per month vs. Verizon's comparable plan with unlimited talk, text and web.2 The Mobile Hot Spot option is available for an additional $29.99 per month (excluding taxes and surcharges) supporting up to eight Wi-Fi enabled devices simultaneously. HTC EVO View 4G brings the best of the EVO experience to a tablet design with a 7-inch touchscreen, 1.5GHz Snapdragon processor and latest version of HTC Sense. It will launch with an Android 2.3 operating system (Gingerbread) and will be updated to Android 3.0 (Honeycomb) when it is available for a 7-inch tablet. As the perfect combination e-reader, media player and portable computing device, HTC EVO View 4G offers a premium entertainment experience with HD-like quality video and a rich web-browsing experience with the ability to browse the web on Flash-enabled sites. Rate plans for the HTC EVO View start as low as $34.993 per month for 3GB of 3G data and unlimited 4G data usage while on the Sprint network. Unlimited text, picture and video messaging are included at no charge. Additional plans, including 3G-only plans, are available to meet customers' needs. Additionally, for a limited time, any customer who purchases HTC EVO View 4G will receive the HTC Scribe™ digital pen (otherwise sold separately) at no charge with a two-year service agreement – providing an additional savings of $79.99 on their purchase. Optional add-on services include GPS Navigation for $2.99 per day or $10 per month and the Mobile Hot Spot option for $29.99 per month (excluding taxes and surcharges) supporting up to eight Wi-Fi enabled devices simultaneously. As the first national wireless carrier to test, launch and market 4G technology, Sprint made history by launching 4G in Baltimore in September 2008. Sprint also ranks as the most improved company in customer satisfaction, across all industries, during the last three years4. Sprint currently offers 4G service in 71 markets in 28 states. For more information, visit www.sprint.com/4G.